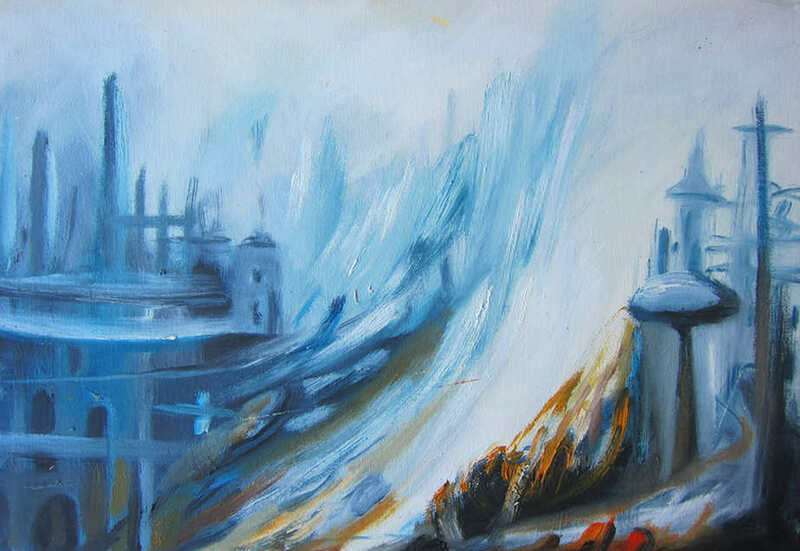 These two Small surreal paintings are titled Cycles of Habit and Sombre Landscape. They are both mixed on canvas and 42 * 29 cm in size. This has become a standard size for many of my small surreal paintings. Most of these works are actually situated in the small masters works page of this website. They have been added to a book I’ve compiled and left at the Professional Centre for viewing. This will be the first of many similar books of Small surreal paintings I hope to compile. Many of these small have sold, so they are proving to be quite popular. You can also see some of them in the Surreal Mixed Media section of the website. I create most of these works through a purely improvisational approach. The paint goes on spontaneously from the outset. Often I work on about thirty or more of these works or more at a time. The layers are built up over a few weeks. I may spend an hour doing one layer on one, then another half hour doing a layer on another and so on. Occasionally ink is added to add depth, colour or vibrancy to the works. 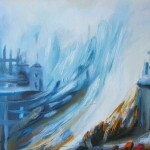 Cycles of Habit incorporates ink into the design while Sombre landscape is done purely in oils. This entry was posted in Uncategorized and tagged cosmic, eternity, masters, small surreal paintings, space, surreal, surreal paintings on October 13, 2014 by Lenny. Emerging Joys – a new painting. 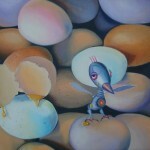 Emerging Joys is another new painting showing at the Professional Centre. Here it is. 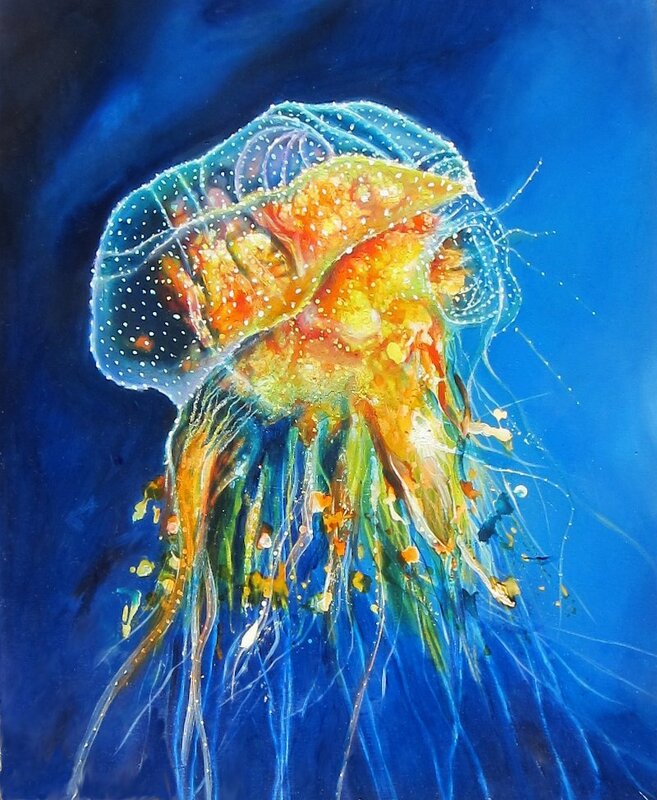 This painting can be found in the Surreal Mixed Media Paintings section of this website. All the details can be accessed in the usual way. Like many of my surreal mixed media paintings this work has been improvised from start to finish. The paintings is built up in layers of mostly oil paint. Ink has also been added to give the work a colourful edge which gives the painting the feeling of joy it expresses. The colours are mostly light. I have refrained from using darkness in the work to help express the happiness and liveliness of the topic. An emerging joy can be the most pleasurable and exciting of all joys. When we anticipate something good coming the feeling of excitement is often greater than when the good thing actually arrives. The colours almost have a Christmas feel to them and the predominance of yellow helps to make everything glow. Light smothers everything. There are lights atop of lights in this painting. While the mostly ink forms give the painting solidity and focus they do not dominate the work. Instead they help to bind the composition and keep the viewer’s eye moving around the work. The painting is only a small one which suggest the idea that the most special joys in lift come from the smallest and most insignificant things. This entry was posted in Uncategorized and tagged cosmic, Emerging Joys, eternity, masters, surreal, surreal paintings, yellow on March 22, 2013 by Lenny. Mecha 2 – a new painting. 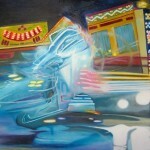 Mecha 2 is one of the new paintings in the exhibition. It’s 100 * 75 cm and painted in oils. This painting is exclusively painted in oils. It is built up using thin layers of oil paint, which gives the work its inner glow. The first Mecha painting incorporated ink into the composition. However, this painting uses only oils. There is a lot of movement in this work and a lot of delicate blending was done in order to achieve this. This is not a mega city like the first Mecha painting. It is a scene of a joy ride at a carnival. The movement is chaotic mimicking he oscillating movement of the fun park ride it depicts. Fun as a topic is something I find easy to paint. 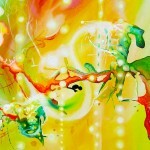 I use bright, unmixed colours in a lot of my works and this retains a freshness to my work. The lights in the painting not only depict the lights of the ride and the fun park but also the joy and fun of the setting. Mecha 2 is not without an element of danger though. The blurred central ride car has a slightly ominous look to reflecting the danger and fear which are a part of the thrill of fun park rides. This entry was posted in Uncategorized and tagged blurry, conceptual, conceptual paintings, cosmic, Mecha, movement, surreal, surreal paintings on March 15, 2013 by Lenny. There will be a variety of paintings produced in the last 10 years on display. There will also be music by Ava and a special guest appearance by John Arkin the ‘peoples politician’. Of course there will be the usual drinks and nibbles. 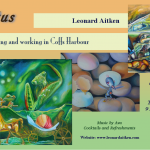 In the last ten years in Coffs Harbour I have explored many topics and painting genres. 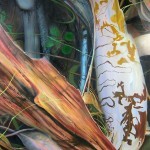 I have probably concentrate on Botanical Paintings and Surreal Paintings mostly. However, the other sections represented on this site have also figured. The great thing about the Professional Centre is the higgledy piggledy space it offers. There are so many smaller spaces within the centre and also long halls and many offices. 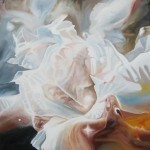 My paintings look great in the centre and the lighting is very flattering to my work. Carol, who runs the centre is always friendly and bubbly. She would be most happy to give you a tour of the exhibition if you visit during office hours. The centre is open Monday to Friday, 9:00 to 5:00 and closed on weekends. 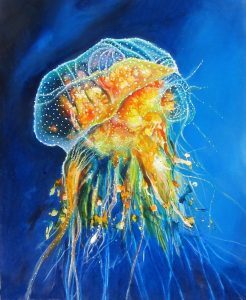 This entry was posted in Uncategorized and tagged australian botanical paintings, cosmic, eternity, exhibition, latest exhibition, painting, paintings, surreal, surreal paintings on March 12, 2013 by Lenny.